Our product is an ingredient exclusively from Uganda, East Africa. For centuries Shea has been used for a variety of healing purposes in Africa including antioxidant skin moisturizer and deep conditioning hair oil. Shea nut trees are a treasure to Uganda and to the planet at-large. This sacred tree starts to bear fruit when it reaches 15 to 20 years of age. 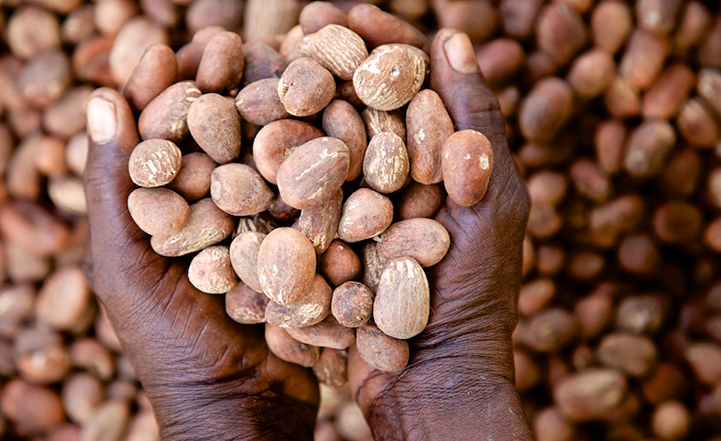 It then continuously produces Shea nuts for a lifespan of up to 300 years. Only until recently this ingredient has become an increasingly popular commodity in high end skin and hair care products made and sold in North America and Europe. Shea oil holds a vast amount of healing properties. It is a perfect healing agent for those who like to enjoy time in the sun as it offers some natural protection against UV rays and makes for perfect after sun care. Shea oil offers outstanding healing properties for dry skin and hair. Being noncomedogenic, it does not clog pores and is safe to use on babies. Pregnant woman have benefited immensely from its ability to prevent stretch marks. It helps in reducing and preventing ingrown hairs and is an excellent shaving lotion. It holds a natural built in collagen which helps to prevent wrinkles on the skin and assists evening out the skin tone while tightening the skin as well. We at Tadah respect the integrity of the cultivation and the extensive preparation of the healing oil. Fair trade is highlighted and crucial in the monetary exchange for this highly valued product. This product can only be produced when specific physical effort and strategic processes are implied by the local village people. We encourage healing through natural means by eliminating toxic chemicals and ingredients by using pure organic resources such as shea nut oil.